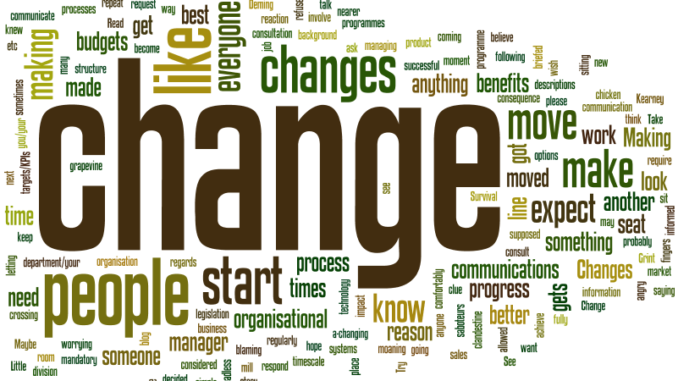 The implementation of change in respective organizations is not an easy process or undertaking. It has been noted that despite the change process being internally informed in some cases and in other instances being as a result of matters external such as mergers, acquisitions, closures and realignments that the respective organizations seek out to improve on efficiency, a number of employees are likely to offer resistance to the change process despite its inevitability. This paper seeks to describe how to determine how effective the change process is once it is implemented and to examine the possible strategies to measure outcome with respect to the organizational change process. The determination of how effective the change process is in an organization is paramount to knowing whether the process of implementing the change process can be deemed successful. According to Senior and others, (2010), all that which can be measured can be made better. This notion informs that the determination of how effective the change process has been since its implementation will enable the respective organizations to establish the worthiness of the change process and identify the variations from what was initially expected and inform on the possible measures that can be employed to address the failings promptly. Among the means that can be employed to determine the efficiency and the correctness of a change process subsequent to its implementation is through predicting the involvement levels of the respective employees. According to Burnes (2004), the involvement of the respective employees in the organization with respect to the change process is recommended. He however adds that the lack of involvement of the employees in the change process does not deter the successful implementation of organizational change. In the determination of how effective the implemented change process is, one should monitor how enthusiastic the respective employees are with regard to how they go about their new tasks as well as their respective requirements and mandates. Employees play a key role in the successful implementation of a change process. Similarly, the employees are also likely to deter the effectiveness of a change process should they resort to not fully embracing the change process for one reason or another. It is therefore arguable that if the employees take positively to the change process, efficiency of the process will be enhanced. Similarly, the enthusiasm showed by the management team following the implementation of the change process. According to Senior & Swailes (2010), the ability demonstrated by the organizations management to prevent inconsistencies and possible conflicts subsequent to the implementation of the change process can also be used to determine the efficiency and the correctness of a change process. He further adds that the lack of an efficient and adequate management team at the top of an organization would likely lead up to the failing of a change process at the implementation phase. Another measure that can be employed to determine the efficiency and the correctness of a change process is the smooth transition of operations following the implementation of the change process. It offers a strong measure to determine the same for the respective organizations. The likelihood of the organization developing some minor problems and hitches is acceptable. However, the prevalence of a number of challenges may be indicators to other far reaching concerns with respect to the implementation of the change process. Taking the above considerations to mind, organizations that efficiently function subsequent to the implementation of the change process can be effectively used as a measure to determine the efficiency and the correctness of a change process as one among the prerequisites that inform how effective and efficient the process of change in an organization is the addressing of the possible deterrents that may frustrate the process in general. According to Senior & Swailes (2010), the identification and the addressing of the likely barriers should not be limited to the internal factors but should also covers an array of external factors that would include: instances of hostility, unfair competition and also the possibility of sabotage from other organizations and institutions. Similarly, the respective employees as well as the management teams should not loose clarity in the description and the requirements of the organization’s vision following the process of change in the organization. It is also paramount to remember that change is not interchangeable with transition and the two are not similar in any way. According to Burnes (2004), transition entails the getting from point A to point B, whereas change refers largely to the event and should therefore not be deemed as being the same.